As of late, the entire music world has been all aflutter with reunions. Most of them have proven to be fairly large to-dos, with groups like Pavement coming back and finding their spot on gigantic festivals, or The Strokes putting out a new album. However, Chapel Hill’s Archers Of Loaf took the most discreet approach, by making an unannounced appearance as an opening act for The Love Language. Since then, Archers have made their network television debut, done a string of tour dates, and become one of the headliners at this year’s inaugural A.V. Fest. 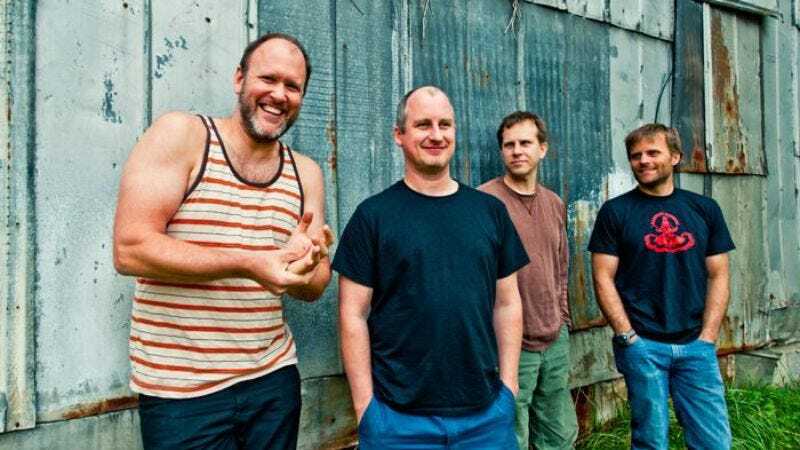 Bassist and rock climber extraordinaire Matt Gentling took some time to talk about why the group decided to get back together, the possibility of new material, and how long you can expect to see Archers Of Loaf back in action. The A.V. Club: How have the reunion shows been going? Matt Gentling: Amazing, and I think that we’re playing to bigger crowds than I think we ever played to back when we were relevant, as I like to say. There’s been a lot of enthusiasm and it’s been a lot of fun. Everybody’s been super cool to us. It’s one of those weird feelings where, until you get a little bit of distance and perspective, every single show feels superlative. Like, the one you just played happened to be the best one out of all of them. [Laughs.] You get a little bit of perspective, and you can kind of pick ’em apart, but it’s been absurdly fun. I can’t think of a single show that wasn’t really, really fun to play. AVC: You did the secret reunion show at Cat’s Cradle in January. Did you want to get back together without any fanfare just in case it didn’t go well? MG: That’s precisely it, honestly. What led up to the whole thing is kind of boring, but basically our kind of prime directive as a band—and as people in a band together—was to maintain our friendship. We thought, “As soon as it stops being fun and we’re not enjoying this, let’s quit doing it so we won’t ruin our friendship.” Eventually, it was just burnout and other things that threw a wrench in our work. And that’s the thing: We were never really good at writing on the road. We were touring so much just to make a living, so our writing was slowing down and we weren’t producing a whole lot of new songs, which is what we kind of took our energy from—the new stuff, whatever it happened to be. We maintained the friendship all along, even though we were broken up. Every time we’d get together, we’d wax nostalgic and get all dorky about the “band days.” It was a really great time in all of our lives, and we managed to stop it before it turned super sour. So consequently, we always looked back on it really fondly. The big obstacle to doing it was feeling cheesy about how everybody is [reuniting] and eventually we just got over ourselves and decided just to do it anyway. AVC: Was the interest from Merge Records there from the start, or did that happen after the reunion? MG: I think the Merge interest was a little bit after the fact. We didn’t really talk to those guys about it until we pretty much decided to do it. That just kind of popped up after we decided to get back together, but reissuing the albums was something we had talked about all along among the band. We did talk about the coolest thing would have been Merge—actually, that may not be entirely accurate, because I do remember at one point, I think it was Mac and Laura were like, “If you guys ever wanted to reissue that stuff we would put it out.” I think that might have actually been mentioned. It’s weird; it happened almost inevitably and sort of grew. I couldn’t be happier with Merge doing it. Alias [Records] is still kind of hitched up to the wagon to a certain extent due to that ridiculous contract that we signed. [Laughs.] But alias doesn’t handle any of the actual aesthetic stuff, or the promotional stuff, or any of that. They just get a check every now and again, and that’s been nice, because we’ve just been dealing with Merge. It’s been bittersweet, like, “It couldn’t have been this good all along?” [Laughs.] Merge has just been ridiculously cool. AVC: Did seeing Superchunk, who you’ve had close ties with since the ’90s, give you some feeling that you could get back out in front of new crowds and still excite people? AVC: Did you go back and listen to the old records to figure out what it was you were going to play? MG: Basically, we just e-mailed each other lists of songs, and as we expected, there was a huge overlap on a lot of things. Like that whole EP [Vs The Greatest Of All-Time], everybody was like, “Yeah, we have to do that.” Then we had the inevitable arguments about certain ones. [Laughs.] But that process was really fun. We drew up a list of probably about 50 songs and we managed to learn 30 of them, or 25 of them, and we’re still trying to learn more of them when we can practice. AVC: Is it hard to get together and play given all the commitments everyone has? MG: The logistics are tough. The way we’ve been doing stuff has been different in a weird way. When we were like, four to six friends driving around in a van, you get this sort of old Manifest Destiny term of “rugged individualism” in you. That’s a distinct vibe, and you feel a sense of confidence in what you do. And you get good at what you do, even if what you do is smelling bad and moving musical equipment around. There’s a certain sense of pride in that. Now, because of our ages and our disparate geographical statuses, we don’t work that way this year. Now we’ve got people to help carry stuff… well, it’s really just one guy. [Laughs.] I just think we’re all kind of removed from the process, aside from the music itself. And I kind of miss that, because that was a dynamic I really liked, because it was like your team—you’re about the size of a basketball team and you’re traveling the country under all your own power and taking care of everything yourself, and that definitely appealed to the little bit of a control freak side I have. I miss that. AVC: You’re talking a lot about the hyper-DIY way of doing things, which still exists, but has changed drastically because of the Internet. But do you think it’s also allowed people to still discover Archers Of Loaf even though the band hasn’t been active? AVC: You probably couldn’t have e-mailed back and forth about what your set lists were going to be. AVC: But now, a lot of bands that are spread out can create music over the Internet. Is that something you see yourselves doing? MG: Plan? No. We’ve never even discussed that, but I think that’s a viable thing. I’m such a freakin’ idiot with modern technology that Garage Band confounds me, if that says anything. But I can buckle down and learn. The Erics [guitarists Bachmann and Johnson] are really good with computer media, and Mark [Price] is just getting into it, but he’s a lot smarter than I am. I think we probably could work that way demo-wise and then schedule some practices and work out new songs. The truth is, we haven’t really had a chance to sit down and discuss it. That’s another thing: We aren’t sitting in a van for long hours. [Laughs.] We haven’t been able to talk about that stuff. AVC: Do you think if you tried writing together it would have the same dynamic? AVC: Those later albums were definitely moving in different directions. It’s not like you were The Ramones and now you’re trying to write piano ballads. MG: Well, it definitely helps that we have all four of the same guys. I think that helps, too. You can run into problems. Even a band member doing something that no one seems to notice, you put in something different that will change what the other guys are doing. It’s like quantum physics, my friend. [Laughs.] Nah, I’m just kidding. I guess the only way to know is just try it, and I think all four of us would be up for it, but it’s a matter of working out all the logistics. AVC: Have you guys put a timeline on this reunion? MG: Sort of, we have. We’re going to reissue more stuff. I don’t know if that’s on the record or not, because I don’t keep up with that, but we’re definitely going to reissue stuff. As long as that’s happening, we’re going to keep playing shows. The pace of this year has pretty much put me in a mental institution. It’s just been too crazy, it’s been too much. And one of the reasons I got burnt out on the band in the first place was I didn’t get to do other things I love, like [rock] climbing and stuff like that. And that’s the way it’s been this year, but our plan this year was to just go after it and do a lot because we were just getting back together. So knowing it was finite, that hadn’t bothered me. And that’s been the case for all four of us in that sense. So in the future, it’s going to be more of a slow burn, and a slower pace. We won’t tour as frantically, because we don’t have to. We don’t need the income, we’re just doing it because we like it, and we love each other, and we love the songs. We’re going to keep doing it. Our plan for next year is to do maybe 10 weekends spread out over the whole year, that kind of deal. And that should be good. That will open up some time, and it may give us more time to practice and write new songs. AVC: This reunion even saw you guys make your network TV debut on Jimmy Fallon. MG: That was crazy! That was a cool experience. I have to say, like, that whole crew of people—Fallon included, although I didn’t say more than five or six words to him—they were all awesome. It was like a family. Everybody was super cool to us, and it was just a neat, weird, awesome experience. AVC: Is that something you would have ever expected? AVC: How is it having younger audiences come out to the shows and embrace the band? MG: I’ve been psyched! It hasn’t all been older dudes like us. There are a lot of younger folks there—and some of those younger folks have been in their 30s, but it’s cool. [Laughs.] The crowd reaction has been neat, and the make-up has been more disparate than I would have thought. And it can’t be more flattering than that. AVC: You’re headlining A.V. Fest along with Hum, another reunited ’90s band. Do you think that bands are getting together less because of nostalgia and more so because it’s something they are realizing is still part of them? MG: Yeah, I think so. And I can’t speak for the other guys, as I don’t have any idea about how they feel about this—I suspect they feel pretty similar to me, but I can’t tell you for sure—but I don’t feel like we’re really tied to the outcome at this point. We can actually take it in a relaxed pace. There was a lot of pressure back when we were doing it just to really, really do it all the time, and you exhaust yourself. It just feels nice that we can kind of tone it down. If this is sort of a novelty thing as far as people coming to see us, and people listening to the stuff, that’s fair enough. That doesn’t bother me. I’m sure a lot of that stuff will taper off. I do experience a bit of personal dissonance with the idea that a lot of this excitement is built up on the sheer nostalgia of the whole thing. It makes me feel self-conscious or a little uncomfortable. That’s not to say I’m not loving the attention and all that stuff. But if we’re having fun playing the songs and doing what we’re doing, we’ll play to anybody who might want to show up, and we’ll do what we do. Archers Of Loaf play A.V. Fest this Sunday, Sept. 11 outside The Hideout.